Do people here have opinions on this fine talented composer? I love him. I just bought the spectacular and lavish LE CINEMA DE MICHEL LEGRAND 4CD-box a couple of months ago. Some fantastic songs and instrumentals on that, spanning his entire career. "Windmills of Your Mind" is one of the most beautiful film songs ever written, IMO, and there's a lot to be said about his suave, elegant jazz style in general. I'm not that familiar with Legrand's works - I only have ICE STATION ZEBRA and FUGA DAL PARADISO. But both of these are, for me, top quality scores. I have the same 4 CD set Thor....excellent! I also have an excellent 2CD sampler called THE MICHEL LEGRAND PROJECT of only instrumental tracks that FSM member soundtrackman made for me. As separate soundtrack CD's, I only have THE THOMAS CROWN AFFAIR and the rejected THE MAN WHO LOVED CAT DANCING. Need to get more individual soundtracks. I don't have much of his stuff, but what I have - and know about - is good. On the CD I have, he even sings!! No surprise there! He also sings His Eyes, Her Eyes on the Thomas Crown Affair score. I seriously recommend FSM's Ice Station Zebra, an excellent and complex score full of melody and something to really get your teeth into......though this might be a bit too complete for you? I have next-to-nothing from Legrand. I really must get ICE STATION ZEBRA one of these days. 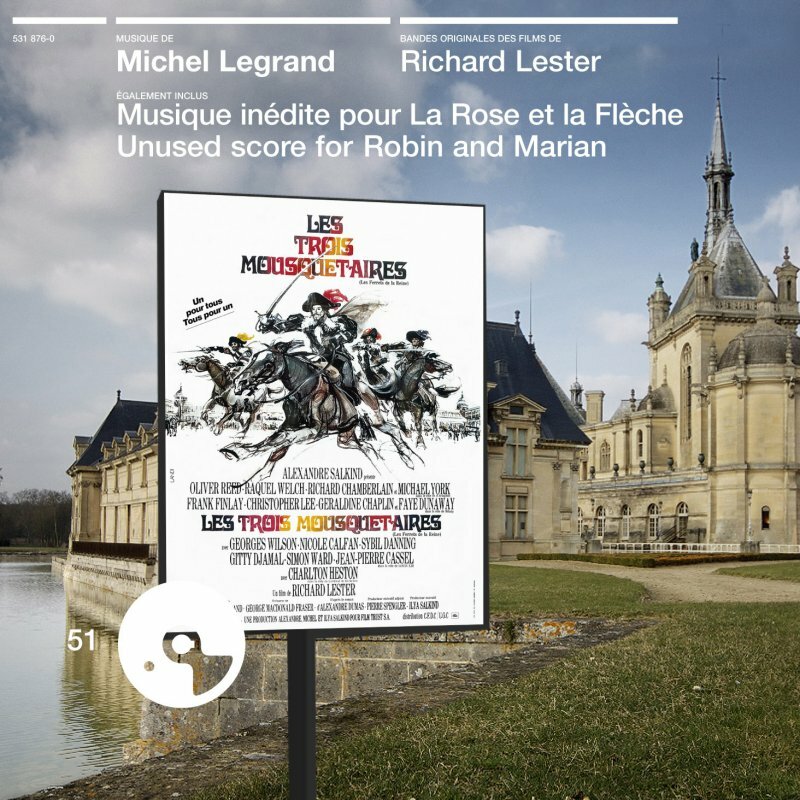 I liked a suite I heard from THREE MUSKETEERS, and it'd be great to get that score reissued. Yes, I have! It's in the same "series", if you will, as the Legrand one. A brilliant album that practially has ALL of Mancini's greatest themes on disc 1 and some unusual, symphonic stuff on disc 2. By the way, I LOVE the ICE STATION ZEBRA score...mostly in the film, but also outside. That "icy" glass music as the sub travels beneath the ice is incredibly moody. I don't have the FSM CD, but I had a crappy-sounding boot once. I gave it away in order to pick up the commercial release, but I never got around to it. Speaking of Legrand's singing, it's a common thing with him. I don't think "His Eyes Her Eyes" is a particularly good song, nor is Legrand a particularly good singer, but it's certainly interesting. Same with his "moaning" on the rejected MAN WHO LOVED CAT DANCING. The Go Between is outstanding! Indeed! A fantastic variations on a theme for Piano, lovely! Thanks Justin, that was very interesting. I'm sure Legrand must have many great stories. I remember Thor mentioning something about a huge discount on the Legrand box set by Universal Jazz/Emarcy label sometime back where the 4cd set was available for $20 (normally sells for over $60). I regretted missing out on it but looks like it still might be available. I saw the same set on BestBuy.com and got it for $19.99 excluding shipping. It arrived today! BestBuy now shows the item as being backordered but I'm not sure if that means that they will get more copies of it later. Those interested might want to keep a watch on it. Looks like BestBuy has the Legrand box set back in stock. Search for "cinema michel legrand"
You will find the box set for $19.99 and shipping within US costs less than $3. 4 cds for less than $23 is a big steal! Grab it before it is gone. It's a brilliant set, real value for money at that price. Is Legrand's 3 Musketeers getting a new release? It seldom shows up on ebay and I've been looking for a copy for quite some time. But there have been a number of listings recently and I wonder if it's related to an upcoming release. That would be fantastic! I have the LP and a short suite from the Legrand box. A new CD would be brilliant. The semi-shonky Harkit is releasing it, and I think Kritzerland is also releasing it. I must get that 4CD box set. Legrand's rejected Robin and Marian is getting a release soon in the 'Ecoutez Cinema' series from Universal France. Is Legrand's 3 Musketeers getting a new release? Was the Kritzerland possibility posted anywhere? Dude! I've posted a bunch of times on this thread when the Legrand box set was available for $19.99 Keep a watch on www.bestbuy.com and you might find it for the same price again. Ah, cool! The Robin & Marian release will include tracks from other Legrand-Lester collaborations including 3 Musketeers according to this. Universal France put out fantastic releases. Just got done listening to the new and I mean new release of The Music of Michel Legrand. No recycled material everything is fresh with new arrangements, orchestrations, and ideas. As soon as I finish my Jamestown Concerto/Perry review I'll do this one. It has my highest recommendation. The review of the new Silva release. I like it. Thanks for the review, Tom. I like this too and will be reviewing it soon. Legrand is underappreciated. So underappreciated that I posted the review on MT and had to add his name for the first time to the list. Not by me, he's a superb composer.